Carrie gets cranky about camping with Henry and "the kids" until Catherine and Rob find danger in the caves of Arkansas's Buffalo National River. Carrie’s husband Henry plans an anniversary surprise: the two of them will join Carrie’s son Rob and Henry’s half-sister Catherine for a camping trip at the Buffalo National River. When Rob and Catherine disappear, Carrie, her friend Shirley, and Henry help search for them. 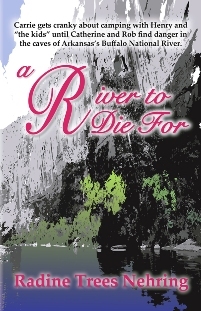 A River to Die For features strong women fighting against literal darkness underground as well as the dark forces of evil. It will take strength to read this book about the best and worst that nature and man can throw at a woman. It will take a caring heart to understand how Henry King and Rob McCrite feel as they struggle to reach the women they love. This is the fifth book in Nehring’s Something to Die For mystery series. 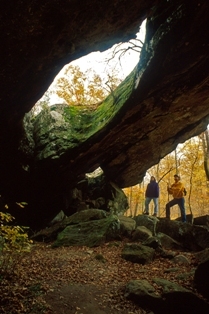 Indian Rockhouse at Buffalo National River. Flames caressed the stone wall, marking it with streaks of black as they rose toward the ceiling. Flames lit the bronze male bodies in the room, and the flickering light became one with a sound now ululating from thirty or more throats. Finally, when the fuel was spent and the flames returned to dust, the voices died as if directed by a giant hand. In the dark, the men left the room, crawling one by one through the narrow opening and out under the starlit sky. The women sealed the hole, this time lighting the purifying fire themselves while their men stood, alert and watchful, behind them. It was done. Separating into family groups, the forms slid away through the forest. Carrie shifted the phone to her other ear and waited in silence, watching chickadees swoop back and forth from the forest edge to her bird feeders. The words popped out before her head had time to process them. She hadn’t known, and was aware she’d replied like some kid in a classroom who wanted to impress the teacher. But that was her normal reaction when her son went professorial. Investigate? Now he sounds downright stuffy. She could almost hear a trumpeted Ta-da. The knock came just in time. She’d been ready to ask if he and Catherine planned to share a tent—when she could squeeze a word in. But it had been thirty years since she diapered this boy-become-man, and Henry’s half-sister Catherine was thirty-four. She supposed their sleeping arrangements were none of her business now, though she couldn’t help hoping Rob remembered what she’d taught him. He probably wouldn’t understand how mothering made her want to ask him about tent plans, nor would he realize that mothering also kept her from asking. Tenderness rolled through her as she thought back to when she’d held a newborn Rob for the first time. He was so dependent on her then. Not now. Returning to the present, she listened to voice sounds coming through the phone, couldn’t make sense of the words, and went back to her private thoughts. How many overt mothering acts had to be dropped as children matured? After kids passed into their teen years, so much about mothering became covert activity. Matter of fact, a few things were necessarily covert by the time a child started school. Baby birds had to learn how to fly solo. Thinking about motherhood as covert activity made her smile. It was important that she and her son be good friends, and, thank goodness, they truly were. She didn’t add: And you two behave. For some reason her son thought that was funny, as his laughter told her plainly. Now she wished she’d asked him about his own sleeping bag plans. If she was fair game for improper comments, so was he. “He...what? How did you...?” She bit her lip and, thank goodness, the phone went dead. When a mechanical voice began chanting “If you’d like to make a call, please hang up and dial again,” she put the receiver back in its stand, shut her eyes, and wondered how her face could suddenly feel so hot. It was a good thing Henry had gone into town to renew her car license. She needed time to think before she saw him. It was obvious he and Rob had already made plans for this Buffalo River trip. One of those guy things, and they’d had no thought of inviting her input. Carrie slumped in her chair. She felt the same way she had back in grade school gym class when softball captains always left her until last when choosing their teams. Oh, yes, she remembered. Two men, bonding...and they didn’t consider her ideas necessary to their planning. Those were two words from childhood she wanted to forget, but here they were again. And then there was a larger problem she could no longer avoid. It was time to deal with that, too. It had come into her life three months and—Rob was wrong—nineteen days ago. Larger problem indeed. Thing was, Henry was so here, so hugely, incessantly here. She’d expected to be very conscious there was a large man in her house after their marriage, but on some days he hovered until she wanted to shove him away and shout, “Go play in someone else’s sand box!” She loved her new husband beyond words, but during the almost seven years between Amos’s death and her marriage to Henry she’d learned to enjoy independence and solitude. Henry, on the other hand, soaked up constant companionship like dry earth needing water. He wanted to be close to her, day and night. She sighed and sat very still in the chair, head bowed. The only thing moving was a finger that twisted one grey curl around and around. Well, Henry would sure find enough closeness on a camping trip if the two of them were stuffed into a sleeping bag like bratwurst sausages in a hotdog bun. Left out. And no space for peace, no time alone, not even in her own home. Except it was Henry’s home now too. That was the problem, as well as the blessing. Oh! Rob said Henry already owned a tent. Umm. What would that be like? After trying to imagine such a structure and getting stuck on vaguely remembered magazine photos, Carrie headed for the garage. Some of Henry’s possessions were stored there. Maybe his tent was in one of those boxes, and now was a good time to see what it looked like up close. The date with Eleanor and Shirley wasn’t until this afternoon, no matter what Rob thought her words meant. Henry’s mind was on trucks as he turned down the lane to Carrie’s—his and Carrie’s—house. Then truck thoughts went to the background while he spent a moment glorying in his new life as a married man. He had a wife who was cute, smart, gutsy, opinionated. Life with her would never be dull. Most important, she loved him. She loved Henry King, flawed though he might be. He missed her right now, though he’d only been gone a couple of hours. He just couldn’t get enough of being close to her, his little love. He wondered what Carrie would think about trading his car for a truck like one he’d just seen on the used car lot in town. That sweet blue truck sparked a lot of ideas. Only three years old, looked new. If he and Carrie went into town for supper he’d show it to her. If he had a truck, they could haul things like bags of bird seed and landscaping timbers so easily. It would be great for carrying camping supplies. Only a few more days and he could tell her about Rob and Catherine’s camping trip plans. He was saving the news as a surprise for their four-month anniversary. Camping would be a new experience for her and she loved new experiences. Maybe they’d find a tent spot near the river where they could hear water bubbling along over the rocks at night. Then, early in the morning, he’d fish. He might even catch something big enough to eat. He’d have to clean and cook the fish, of course. Wouldn’t ask her to do that. She wasn’t much on cooking anything from scratch. He parked in the drive by the front door in case they did go out for supper, picked up his papers and license plate sticker, and headed into the house. He heard a distant thump, then another, and followed the noises through the laundry room and into the garage. Carrie stood in the middle of storage boxes scattered over the floor where his car would normally be parked. She was pulling a large bundle from one of the boxes. She’d been searching through his things. Why? Then he realized what she was tugging on. She’d found his tent, and when she looked up at him, he saw storm clouds. Huh? There had to be a sensible explanation for the look she was giving him. What...? Rob! He’d forgotten to warn Rob he was saving the camping trip as an anniversary surprise. He’d already bought her a down sleeping bag as his gift. Rats, she’d probably been talking to Rob, and he’d gone and spilled the beans. “I found your tent,” she said. He studied her face. This wasn’t good. She was hurt, maybe even jealous, because he and her son were rapidly becoming good friends and Rob discussed the camping trip with him before bringing her into the picture. Henry’s many years of police work had made him pretty good at reading emotions on faces. She was just standing there, saying nothing. Henry stared at her and wondered what he should say next. His head had gone suddenly empty. What to say? Heck, what to think? At the moment it didn’t matter. After giving him a happy smile, Carrie pushed through the boxes and walked out of the garage. “I’ll put that stuff back later,” she said as she disappeared into the laundry room. For a moment he stood in the middle of the garage floor staring after her, thoughts churning. Then he looked around the space where his car would normally be. The blue truck would fit in just fine. He took the car dealer’s business card out of his pocket and headed for the phone.